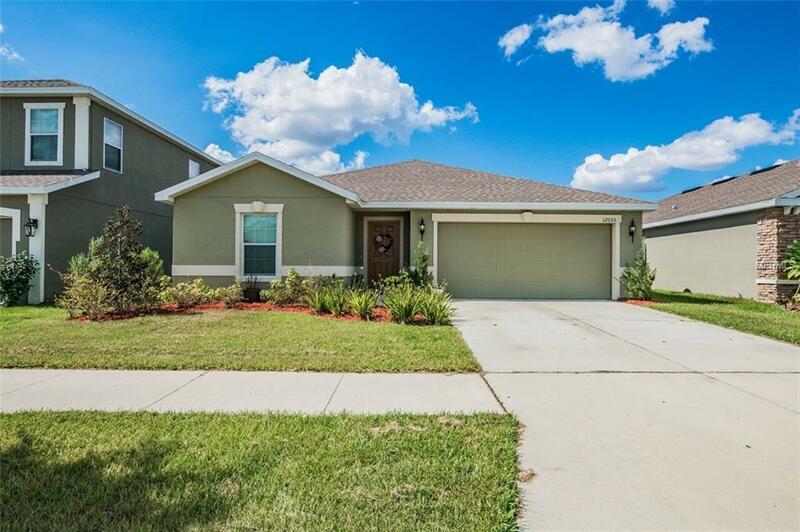 Beautiful 3 Bedroom, 2 Bath Home with a 2 Car Garage built in 2016! This Jasmine Cove floor plan by Ryan Homes feature an open and inviting floor plan with vaulted ceilings in the main living areas. The kitchen features natural wood cabinetry, closet pantry, all appliances, and a large island with a breakfast bar. It overlooks the dining and living areas that lead out to the covered lanai and nicely sized backyard. The master bedroom includes high ceilings, walk-in closets, and an attached en-suite bathroom with a double vanity and stand-up shower. The second and third bedrooms are on the other side of the home, making the ideal split floor plan. The Carriage Pointe community offers an amazing active lifestyle with a stunning community pool, 2 playgrounds, tennis and basketball court, fitness center, and clubhouse. Only a short distance from the Manatee Viewing Center, Apollo Beach Nature Park and Beach, St. Joseph's Hospital South and Westfield Brandon Mall with tons of shopping, restaurants and entertainment. It's conveniently located near I-75, 41, and US-301 making it an easy commute to anywhere you need to go! Call today to schedule a showing before it's gone! Pet Restrictions No Aggressive Breeds Only 1 Pet Under 35Lbs. Must Provide Photo Of Pet And Shot Records At Time Of Application. Listing provided courtesy of Tampas Best Realty Llc.